Just in time for your holiday weekend (if you’re in the US) a quick and delicious salad to accompany your burgers, steaks, etc. This is a great way to use leftover roast chicken and/or another use for that package of bacon you’re opening for bacon cheeseburgers this weekend. If your spouse permits, adding shallots, onions, or green onions would probably be a tasty addition to this salad. Everyone have a fun, safe and delicious weekend! Cut your bacon up into little chunks and fry until crisp. Whisk together the mayo and the red wine vinegar to make the dressing. 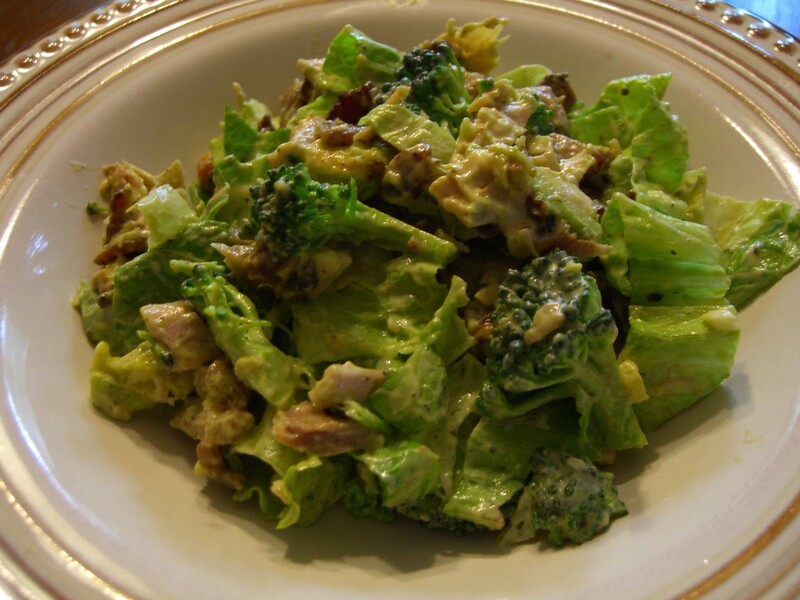 Combine chicken, bacon, avocado, broccoli, lettuce and garlic and pour dressing over mixture. Mix thoroughly and salt and pepper to taste. Makes two large or four small servings. You had me at bacon. I’m going to try this one.